This book is a definite heart jerker. 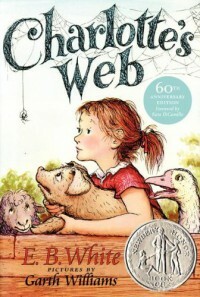 It's about a little girl, Fern, and a runt piglet she saves from her dad. Fern raises the piglet she names Wilbur until her father forces him out to the barn where is care is then taken over by a very ambitious spider. Together with the help of a rat, they do amazing things to ensure Wilbur gets to live a long and healthy life. I would recommend this book for 3rd grade and up. There are so many fun ways to use this book in the classroom. Depending on the grade level, I would love to use this book to do things like an indepth group book analysis (age appropriate) or individual book reports or even have the students use mixed media to create their own word web.